Your gallbladder can develop inflammation and form gallstones. Gallbladder problems can cause certain side effects, such as a loss of appetite. If you begin to experience pain, loss of appetite or nausea, seek medical help right away. You could require medication or surgery, depending upon the severity of your condition. Your gallbladder is a small, almost pear-shaped organ located near your liver, stomach and pancreas. It stores bile, which is used to help break down foods -- particularly fats -- during the digestion process. Fatty foods primarily cause bile to be released from your gallbladder into your small intestine. High fat, high cholesterol diets can cause your gallbladder to work doubly hard to keep up with your body's needs due to your diet. Pregnancy can also cause gallbladder complications due to limited space. Loss of interest in food and loss of appetite can indicate gallbladder disease and gallstones, according to the University of Maryland Medical Center. If you're suffering from gallbladder complications, you may also experience nausea, vomiting, abdominal pain and fever or chills. You can also experience diarrhea and feel fatigue. Depending upon the pain and inflammation, your pain could range from a dull ache to a sharp, intense stinging pain that's almost unbearable. 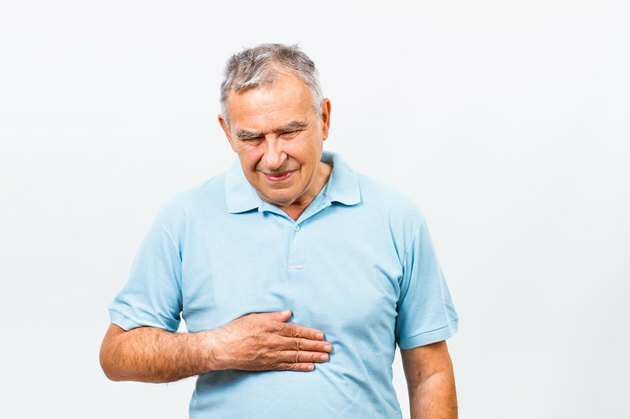 The symptoms associated with gallbladder complications could be the result of a high fat, high cholesterol diet, gallstones or just general gallbladder inflammation. When large amounts of cholesterol cannot dissolve into the bile, a gallstone can develop. The gallstone then blocks the gallbladder duct, which leads to irritation, swelling and pain. Sometimes a large gallstone can form and block passageways, then move away and become lodged in another area. This can cause pain to come and go as the gallstone becomes lodged and unlodged. Your health care provider may recommend or prescribe an anti-inflammatory medication, antacids and possibly nausea-reducing medication until your gallstone dissolves. Talk to your health care provider about pain management until your gallbladder is feeling better. It may be necessary to surgically remove your gallbladder if the duct is severely clogged, if there are multiple gallstones or if the medication has little to no effect on your condition. Your health care provider may also choose to perform shockwave therapy to break up the gallstones into smaller pieces so they dissolve more easily.